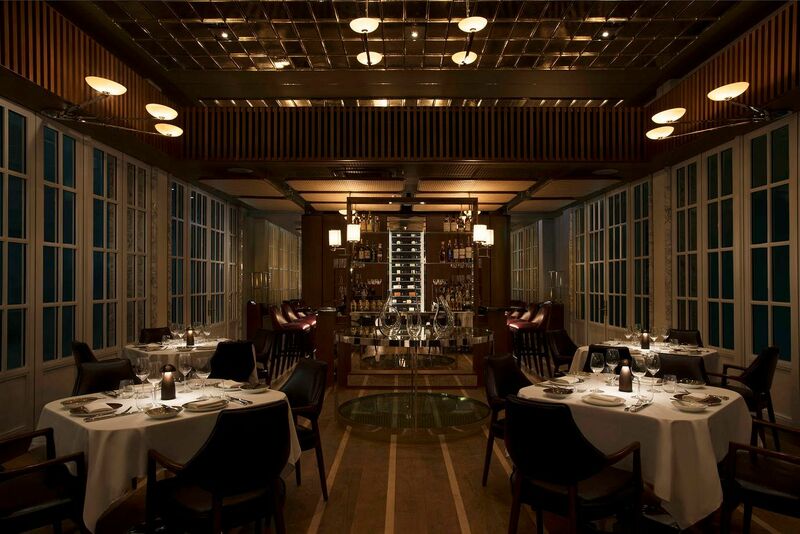 SINGAPORE - (THE BUSINESS TIMES) Spago has landed in Singapore. Granted, it's taken a few decades - it was in 1982 that Wolfgang Puck opened his canteen to Hollywood stars in Beverly Hills and became one of the world's first celebrity chefs. But it's never too late for a dose of Tinseltown fairy dust, it seems. Perched high on the rooftop of the Marina Bay Sands, Spago lays it on thick: iconic view, high-heeled hostesses, posh interiors, a mixture of exclusivity/Vegas-like theatricality and - a never-ending stream of people in bathrobes and bedroom slippers shuffling by on their way to the swimming pool. We have never seen so many people swaddled in waffle weave since our last health screening. You've seen the artistic photos of MBS's infinity pool shimmering in the light of dusk? Welcome to the behind-the-scenes view. For those who never look closely at restaurant addresses and think Sky Park equals ex-Ku De Ta and now Ce La Vi, remember that you need to get to Tower 2, and go through the tedious process of getting security access cards from the Spago counter and be squashed in the lifts by aforementioned toiletry bag-toting hotel guests schlepping their way to or from their rooms. 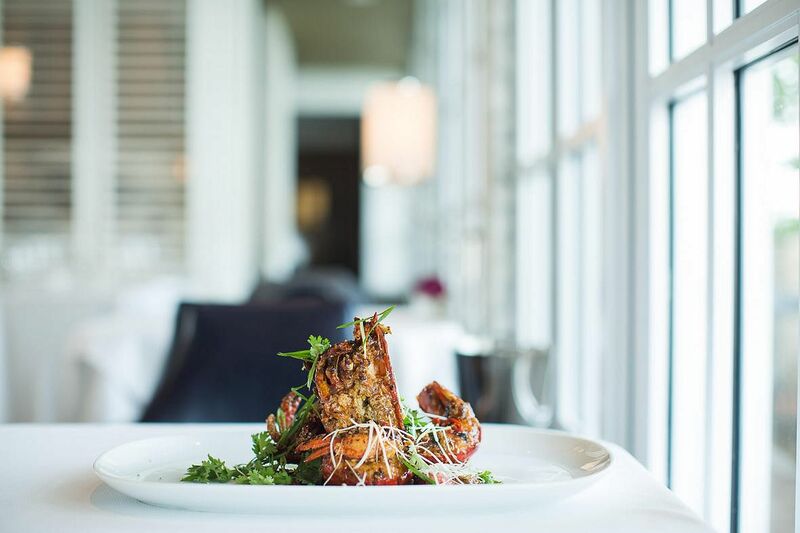 There are two ways to eat at Spago - in the more casual bar area that overlooks the infinity pool, or elegant dining room that recalls the aesthetic heyday of colonial black and white bungalows. White aluminium folding doors, starched tablecloths and solid leather upholstered chairs exude old-school confidence. Smartly-dressed servers in ties and waistcoats are the clue that your meal is not going to be cheap. We initially discount the exuberance of our server, Albert, as being in the same category of Chinese restaurant staff who always want you to order the most expensive sharksfin, abalone or Alaskan king crab that just flew in on the red-eye. The way he extols the virtues of the $59 chirashisushi, you're convinced there's a stall in Tsukiji fish market with Wolfgang Puck's name on it. He does the same with the lobster ($98), cote de boeuf ($175 for two) and the Sonoma lamb chops "which come from the US" and therefore costs $88. He's slightly less enthused when you show interest in the pastas ("well, they're very small portions") or the $42 organic pan roasted chicken ("oh uhm, that's nice too"). 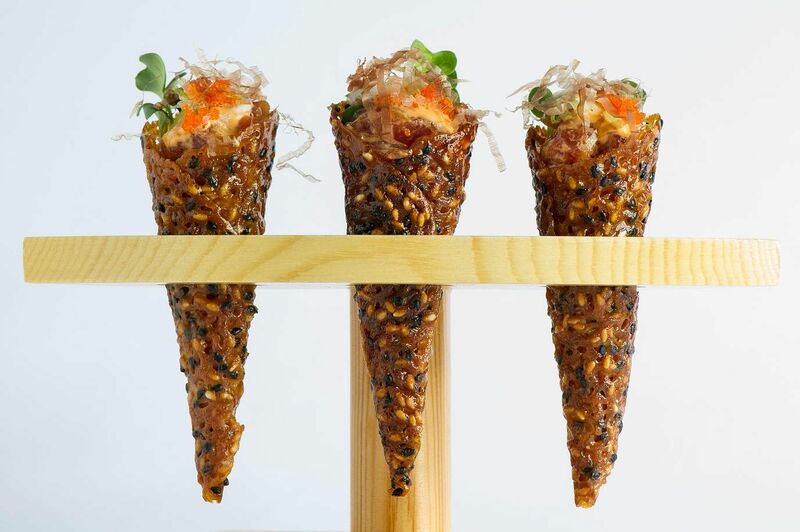 The meal kicks off with an amuse bouche of a Wolfgang original that's been copied so much that it's now a cliche - chopped up marinated raw tuna stuffed into a fragrant, crunchy sesame seed-speckled cone and topped with sprouts and herbs. The tuna quality isn't great, but it's hard to find fault with anything served in an ice cream cone. Not so the chirashisushi, which is fine only if you're an A-list actress who needs to give the impression that she actually eats. But not in a city where $40 can get you a solid bowl of rice showered with chunks and slices of raw fish. Instead, you get a dainty, composed platter of average quality sashimi presented in attractive curls and twirls, and just two tiny balls of sushi rice hiding under wispy thin whitebait crackers. Dots of intensely flavoured yuzu and miso sauce are the only sources of interest in this underwhelming starter. On the other hand, the intriguingly described kaya toast ($33) is luscious but minuscule. 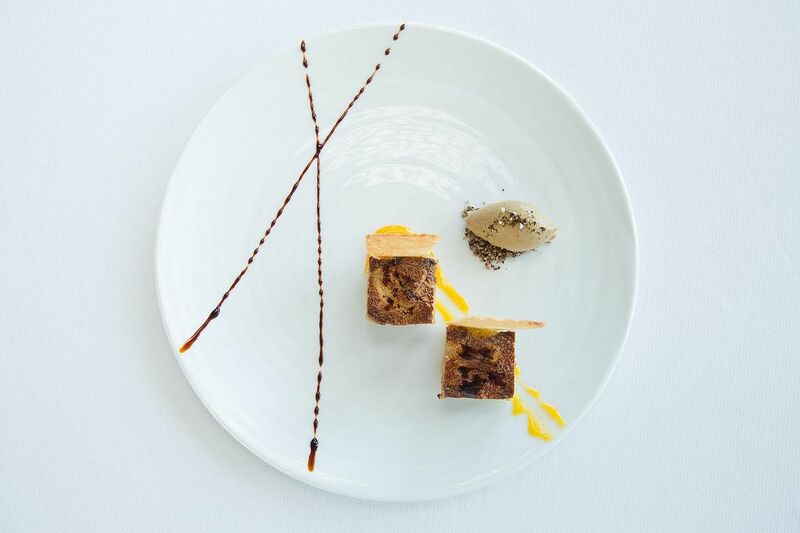 Two tiny but perfectly cooked lobes of foie gras are placed on squares of toast, very lightly spread with coconut jam (Spago's nod to the local dining culture) with a scoop of whipped foie gras mousse on the side. You don't really taste the kaya unless you look out for it, but it's a pleasant alternative to the usual fruit-based pairing. While initially reluctant to splash out the $98 on the 'Angry' live Maine lobster that Albert heavily recommends, it turns out to be a veritable steal as a large specimen appears with a flourish at your table smothered in a chilli red garlic and black bean sauce and a shower of scallions that could rival your favourite zi char stall's version, sans the wok hei. Albert skilfully lifts the meat out of its shell and plates it - it's big enough for two people, and a bowl of steamed rice on the side is on hand for mixing with the sauce. The meat is plump and fresh, and the sauce a harmonious balance of Asian flavours that doesn't taste out of synch. An attempt to spite Albert by ordering the pan-roasted chicken is a mistake as the bird is done to American tastes - well-salted and the breast cooked thoroughly to the point of dryness. We send it back in exchange for the lamb and the extra cost is worth it: three juicy chops with an array of enjoyable accompaniments - crunchy falafel 'macaroons' sandwiched with tzatziki, smoky eggplant puree, spicy aioli and a sweet creamy herb sauce. Don't miss ordering the pommes aligot as a side dish, even though it's not on the menu. 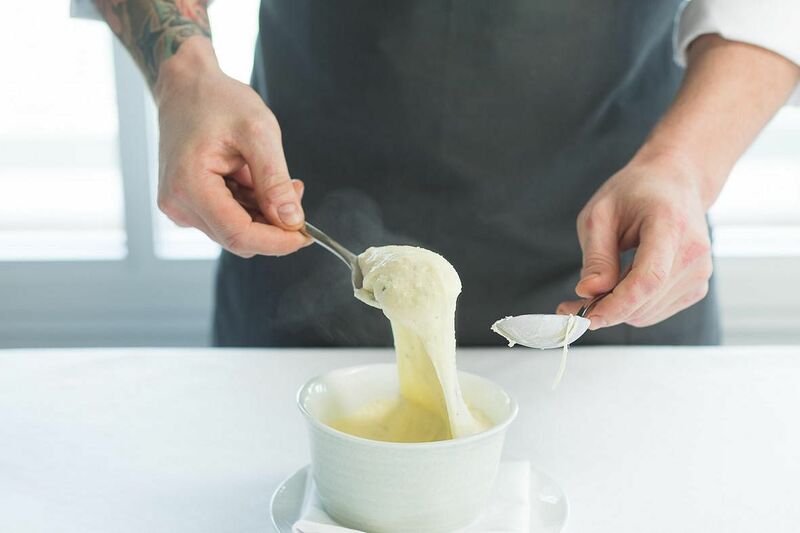 Albert tells us about it, and this rich, creamy puree of potato, comte and mozzarella is whipped into a malleable, delicate playdoh that he scoops and twirls at the table before putting it on your plate. This is fun food that also strikes a comforting chord. We have no room for dessert, so instead we contemplate how well Singapore diners will take to this Californian import that is clearly designed (and priced) to please a hotel/casino clientele. Despite a few hiccups with the food as the kitchen attunes itself to the tastebuds it chooses to cater for, the cooking fundamentals are sound. Run by executive chef Joshua Brown who also helms the successful CUT, it hasn't even been open a week so give it a little time to settle down. And be assured that if Albert and company come on a little strong, they really are professionals at what they do. If you're a fan of CUT and enjoy the slick if manufactured Californian experience of a Wolfgang Puck restaurant, Spago's should not disappoint. As for us, we feel like the outsider without the bathrobe and free access to the infinity pool: we're standing there, but we don't feel like we belong. This article was first published on October 12, 2015.